Grant Wood's painting of an Iowa farmer and his wife hangs in the Art Institue of Chicago and is called "American Gothic." It is one of the most recognized paintings in modern American art, and was painted during the Great Depression in 1930. J. Seward Johnson made a sculpture of this painting, and titled it, "God Bless America." 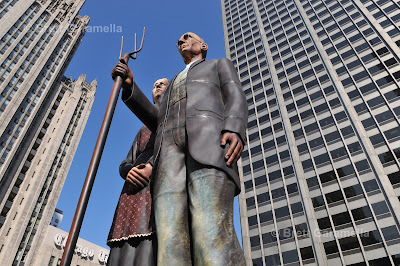 Last week I saw this sculpture standing next to the Tribune Tower and NBC Tower in Chicago.